Our ESL Curriculum is in use in more than 80 countries around the world. Bringing our lessons to the children in the mountains of Nepal. Learning English with Laughter in a classroom in Nepal. Presenting the teachers in Nepal with our materials for teaching English. for the teachers we taught in Kathmandu. Our meeting with the Eastern Ukraine English Club in Ukraine. Our students hard at work in Karlovy Vary, in the Czech Republic. Learning English With Laughter lessons are enjoyed by these students in the Dominican Republic. A break between workshops at the University of Luhansk in Ukraine. A warm welcome for teachers Daisy and George before giving a workshop in Brazil. 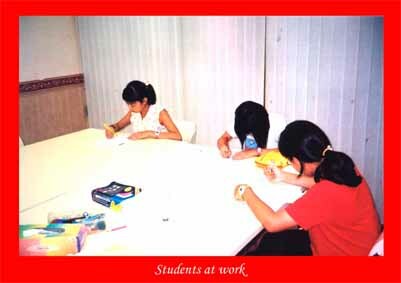 Children in Hong Kong study their papers as they play Word Bingo in their Learning English With Laughter curriculum books. A break between classes with our Tibetan students in Northern India. 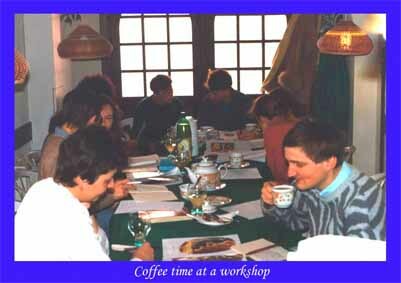 Coffee break during a workshop given by Learning English With Laughter in the Czech Republic.